« Wrath Encounter Design for Healers – Has Blizzard “Succeeded”? There were changes? I must have missed them. The Divine Hymn change is slightly different and more indicative of a general design movement by Blizzard. Left, right and centre, abilities with big cooldowns are having their downtime (and often their durations) slashed to fit in with the limited attempts mechanic. The Sated debuff was, in a way, the first step on this road. By introducing the debuff, the cooldown of Bloodlust could be reduced – so guilds running 10-mans with one Shaman didn’t have to wait for the cooldown in between attempts on bosses. Nowadays, with even more importance placed on fewer/higher quality attempts on bosses, it’s obvious that people are going to get bored sitting for those 2 extra minutes waiting for a skill to come off cooldown when they’ve probably already worked out their strategy for the fight in the kind of detail you’d find on the Bayeaux Tapestry. So Divine Hymn is one of a number of abilities (Soulstone, Army of the Dead) that has been buffed as a result! I’m going to be blunt. 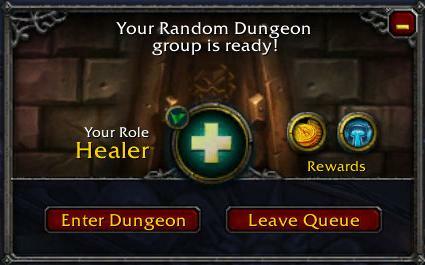 I’m pretty sure that the Dungeon Finder is the single greatest non-raid-instance thing Blizzard have put into WoW. 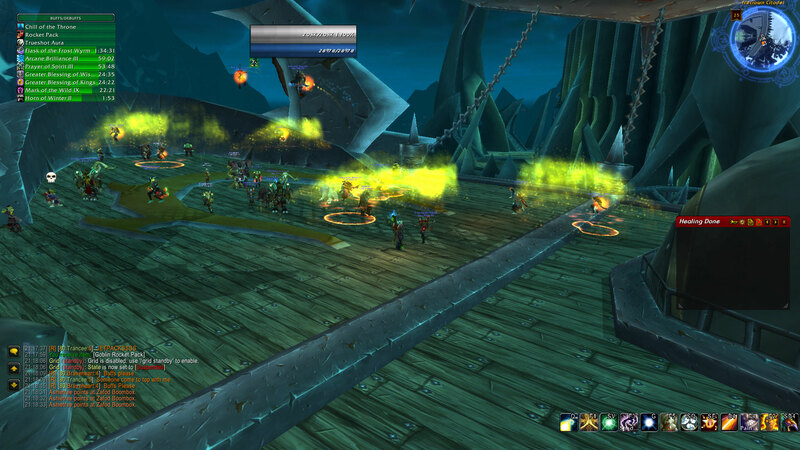 Better than arenas, better than dual specs, better than the previous revitalisation of heroics. Simply put, it takes away all of the hassle of finding a group and/or dealing with party leaders who require you to have a given achievement (like Epic, in one notable case I encountered a few months back) while still allowing people to run heroics with appropriately geared party members. And with the introduction of the heroic daily for more new Emblems, the pool of players which you’re drawing from has a much higher average standard of maturity. It’s a win-win situation! But I think my biggest surprise so far has been the general quality of the groups I’ve encountered. Pick-up groups have a reputation; that of being constantly unreliable. There’s always the Hunter who leaves Growl on, or the tank who can’t hold aggro on two mobs, right? Perhaps I’ve just been incredibly lucky, but all of my groups have powered through them without a problem, regardless of the individual skill levels of the members. This is something that I think many people are missing and one of the reasons that the timing of this has been excellent. In 245 gear and the like, it’s getting to the point where heroics are obsolete other than to gather more Emblems of Frost from the heroic daily and Triumph emblems for those who need to catch up (like me and my recent respec to Shadow; more on that later). 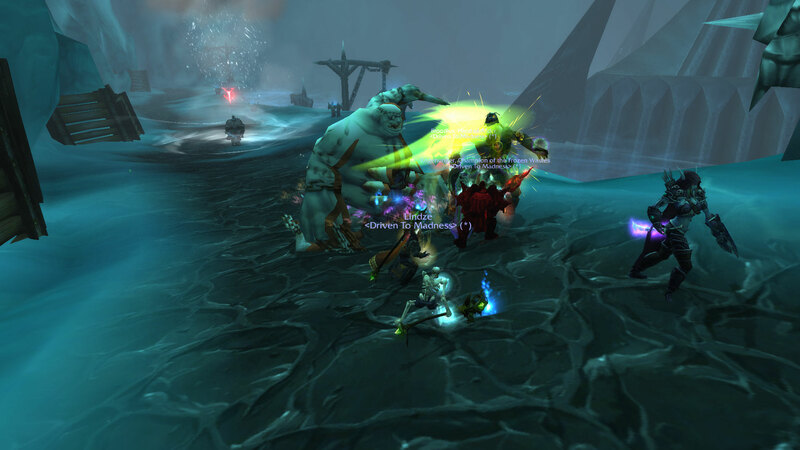 Most of us could 2-man a heroic and Prot Paladins can solo them! So if you’ve only got two “functioning” members of your group, chances are you can still make your way through most old heroics without too many problems. Two or three patches ago, PuGs would have a much higher rate of failure and it’ll be interesting to see how this works when Cataclysm arrives. 3.3 has introduced more new instances than any other patch in recent memory. Three new dungeons in a handy one-to-the-next system and the most anticipated raid since Sunwell were all added together in one giant bundle of wonderful. So, what’s the verdict? Be aware, if for any reason you haven’t covered this material and want to experience it without prior knowledge, there are considerable spoilers below. Well, dungeons first. I’ll be honest, the start didn’t exactly blow me away; although the Forge of Souls has a few spectacular views and some shiny graphics on bosses (so pretty much the opposite of Trial of the Champion!) it still didn’t strike much of a chord with me. There wasn’t much to keep me interested between bosses! After the initial “wow” view of the forge itself, there wasn’t much left to impress me; just a few metal walkways and trash you could pull out of most other dungeons. As for difficulty, I’d say it was pretty well-pitched. We didn’t have much trouble in 245 gear, but I can definitely see the reasons for it being locked out to 80s below a certain level of gear. Next came the Pit of Saron, where things started to get interesting. The three dungeons follow a linear story; Sylvanas is there at the beginning, end and sometimes the middle of every dungeon telling you what the deal is with what you’re doing. Apparently you’re trying to punch a hole in the Lich King’s defenses and trying to find a potential weakness of his that can be exploited. It’s all fairly standard storytelling and serves well to tie the three dungeons together. Together with their half-hour nature, you can comfortably run them (as I did) with the same PuG group. The bosses here were a lot more interesting; Garfrost and Ick/Krick being particularly interesting. Line-of-sighting stuff is nothing new, but on Garfrost it’s the nature of the debuff that’s fun and as a Priest if someone doesn’t LoS him you can spam dispel them instead during the downtime. Ick and Krick is an encounter that’s just fun. Go and try it, if you haven’t already! It’s one of those encounters like Jaraxxus or Shade of Aran where there’s always something to react to or run away from or similar; the kind that every raider enjoys! Finally, we were introduced to the end boss’ big bad Frost Wyrm and told to run up a tunnel with falling icicles the entire duration a la Hodir. It might have been an interesting encounter had the icicles actually done much fall damage, but even standing right in the middle of a circle didn’t seem to push anyone’s health back too much that I couldn’t deal with it in a couple of gcds. Still, credit to Blizzard there for trying something new and interesting and I do always enjoy having a little movement challenge to keep my brain busy! The final boss itself isn’t much harder than any other heroic boss, just with considerably more health (having never seen the “million” denomination on a heroic boss’ health bar before, my first reaction was “it’s bugged!”). All-in-all, good fun. We moved swiftly onto Halls of Reflection. In Soviet Russia, Lich King chases you! I must say, Halls of Reflection was by far and away my favourite of the three. The first reaction I had was that the Falric and Marwyn encounter was actually challenging. It’s the first heroic encounter I’ve ever done where I felt under similar pressure to how I feel during a raid. It really is that tough on the healers. At the start I just figured it was your standard add-waves conserve-mana kind of encounter, but when I found myself drinking after wave 8 or 9 because all my cooldowns (and potions) were already used up, I realised that this was pretty aggressively tuned. Without a full 245 or better tank who’s adept at picking up several mobs, expect to be healing everybody a lot. Tanks I talked to also expressed their amazement at the difficulty of both encounters in the instance. Thankfully, the bosses themselves (Falric and Marwyn, who appear after 5 and 10 waves) aren’t that much of a problem and you can comfortably regen mana for that portion of the encounter. The Lich King encounter is very well designed and I enjoyed it immensely; although as a tank or DPS, I imagine you might be more concerned with killing stuff. I know that several people were worried pre-patch (and pre-datamining) that the encounter would be a 5-man version of the raid instance, but we all really knew that Blizzard wasn’t going to be that silly! In the end, what they’ve come up with is a great, tense, story-building encounter that anyone remotely interested in the lore would be a fool not to play through. It’s fairly tightly tuned but without knowing how close LK has to be to kill you (we never wiped!) I can’t say with certainty how close we ever were to dying. While Halls of Reflection is far and away the best of the three, you have to play through the previous two to access it the first time; so you’ll get to have an opinion of your own on all three! The greatest challenge to organisation yet: Jetpacks! It’s true, we can’t really judge the ICC raid yet because of the gated progression system. There’s only four bosses out and no hardmodes, so as more encounters are released throughout January we’ll have a clearer idea of what the raid is like. But the major deal for healers right now (and indeed what my next article will be based around) is Chill of the Throne, the passive zone-wide effect that reduces chance to dodge by 20%. The thinking behind the debuff, as explained in a previous article, is that gear has progressed so quickly that before 3.3 the only way to challenge tanks with humongous levels of avoidance was to have the bosses hit increasingly hard. With this new debuff, a boss’ attack strength can be toned down and it’s supposed to feel more like a constant stream of damage instead of one gigantic hit; the idea being that you can plan your heals better instead of just spamming your biggest heal. How is this working out? The answer so far: very well. There have been a few encounters already, notably Lady Deathwhisper, where I see my assigned tank’s health at 80% and I know I don’t have to worry. I throw him a PoM or a Renew, heal someone in the raid who’s being targeted by a Shadow Bolt or another tank that’s in difficulty and then go back to my assigned tank. Two gcds later he’ll have taken damage, but it won’t be life-endangering – because a constant stream of damage over 3 seconds isn’t always enough to kill a tank any more! I throw him a Penance and he’s back to a comfortable level of health. This kind of neatness is what makes healing fun for me and I hope it’ll continue to work well when the later encounters are released. Previously if you left a tank for 3 seconds you were relying on luck; now it’s less about RNG and more about logical thinking. Fantastic! Finally, a brief note about my recent respec to Shadow; those of you who have armoried me recently might notice my mainspec is now Shadow. I recently joined a new guild and in my application I put “open spec” because I knew they had a fair few Priest healers. They chose Shadow for me and I respecced/am regearing accordingly. Where does this leave my blog? No idea. I’ll certainly continue, but it’s probable that many of my future articles will be based on theorycraft and chats with other Discipline Priests from Kazzak. Haste stacking, what I’ll be writing about next, is something I haven’t had any time to test but which I can see both pros and cons for and I’ll be talking to a few Discipline Priests to get their opinions on it.